To grow potatoes indoors, find a container with a capacity of at least 2.5 gallons. Chit your potatoes by leaving them in natural light to sprout. Then, place them on top of a few inches of soil in your container with eyes facing up. Add some more soil and slightly water. Check soil moistness every few days. Once plants grow, add more soil and hill them. Potatoes are ready to harvest when the plants begin to turn yellow. The easiest and quickest way to plant your potatoes indoors is to use potatoes that have already sprouted. This means that they’ll have at least one eye, but preferably more, with a sprout protruding from it. Sprouting needs to have happened for the potato to successfully produce more potatoes. Photo by Ruth Hartnup licensed under CC BY 2.0. If your potatoes have not yet sprouted, you can chit them yourself. Chitting is the process of keeping potatoes in the optimal conditions for quicker sprouting. To chit your potatoes, find the eye of the potato that looks most promising, such as one that has begun a small sprout. Turn this part facing up and place each potato in a container, like an egg carton. Keep them near a window with natural light and watch your sprouts grow over the next few days or weeks. Once your potatoes have sprouted, you need to make them small enough to plant. If your potatoes are small, or about two inches or less in diameter, you can plant them whole. If not, they’ll need to be cut. Cut each potato into chunks of no more than two inches, ensuring that there is at least one or two eyes with sprouts on each piece. Let your cut pieces sit at room temperature for two to three days to allow them time to heal. Being one of the easiest crops to grow, potatoes can grow in virtually any space or container. But, when you’re growing potatoes indoors, you’ll want to ensure you have the best container for optimal growing conditions. You can choose a plastic bucket, a gardening pot, or even a bag of fertilizer to plant your potatoes indoors. Just make sure your container has at least a 2.5 gallon capacity for maximum potato yield. 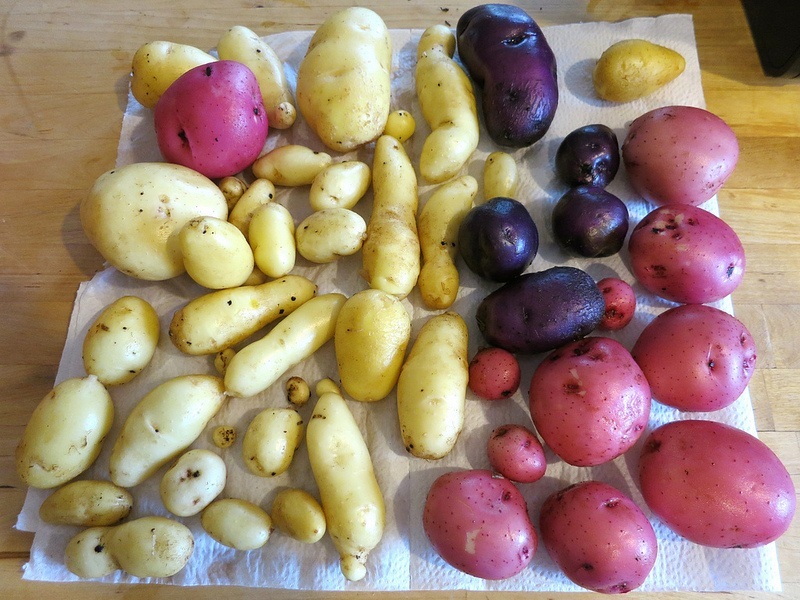 Anything smaller, and you may produce very small, or very few, potatoes. Choose a container with a height of at least several inches, as your potatoes will grow up and you’ll need to add more soil through the growth process. Your container should also be able to drain well since potatoes don’t grow well in very wet conditions. If your container doesn’t already have holes in the bottom, poke or drill a few through. Your potatoes are ready and you chose your containers, so it’s time to plant! First, place three to four inches of a loose, grainy potting soil at the bottom of your container. If you have a more alkaline than acidic soil, consider adding an acidity source, like sulfur, which helps potatoes feed more efficiently. If you have a wide container, you can then place two or three potatoes on top of the soil. If you chose a smaller container, stick with one potato. You can always experiment with your first group of potatoes and adjust your amounts to your containers with the next. Each potato should have its most productive sprout pointing upwards. Add more soil so that there’s about two more inches on top of the potatoes. Water the soil until it’s moist, not wet. The indoor potato planting process is simple, but your potatoes will need some maintenance throughout their growth cycle to ensure a high yield and healthy spuds. First, find a good, natural light source in your home to ensure several hours of light per day, or store the potato containers in a greenhouse. Then, read these tips for feeding and hilling your indoor potatoes. Your potatoes won’t need frequent watering, but the soil must be kept moist so they have a consistent water supply. Typically, after the first watering after planting, you won’t need to water your potatoes again until you see the first signs of the plant sprouting through the soil. Check your soil moistness and slightly water if needed. As a general rule, check the soil every two to three days. You can stop watering once the plants begin to die off, as this is a sign your potatoes are reaching full maturity. You can also add a post-planting, organic fertilizer to your soil sparingly for added nutrients to aid growth. It’s usually a good idea to dilute your fertilizer, as potatoes don’t need an excessive amount for optimal growing conditions. As your potatoes grow, it’s necessary to hill them, or create a mound of soil up and around the stalk of the potato plant. The hilling process helps keep all of your potatoes well-underneath the soil to avoid exposure to light. Once you have a few inches of plant growth, move about four to six inches of soil height around each stalk. Continue to do this as your plant grows until you have a mound of soil about six inches high. Once your plants begin to turn yellow, they are usually ready for harvesting. You can also wait until the plants die off completely to ensure maximum growth of the spuds. Double check a potato or two for maturity by rubbing your thumb gently against the skin. If it stays in place, it’s ready to harvest. To harvest your potatoes, gently pull the plant from the container and pull off each spud. Brush off stuck soil and allow them to dry in the sun for a few hours before cooking them.